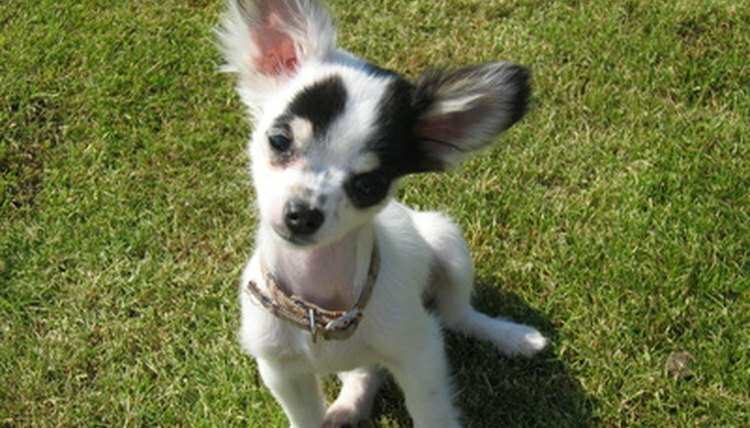 Chihuahuas, like all dogs, are susceptible to fleas. Luckily, the chihuahua’s tiny stature doesn’t preclude the most toxic and effective flea treatments, and the chihuahua is not known for flea allergies or particularly sensitive skin. While numerous flea treatments are available to rid your chihuahua of fleas—topical solutions, sprays, dips, shampoos, powders, collars and oral and injectable products—monthly topical solutions are generally the quickest and most effective. It’s a good idea to give your chihuahua a pre-flea-treatment bath to wash off as many fleas as possible, because you won’t be able to get him wet after treatment. Run the tap of your bathtub or sink until the water flow is comfortably lukewarm. Close the drain so water begins filling the area. Place your chihuahua into the area as the water is filling or after it reaches about his lower chest level, depending on his preference. Wet your chihuahua thoroughly, using your hand or a small unbreakable cup to scoop water and soak his back, sides, chest, neck and legs. Avoid getting water into his ears and eyes. Scoop water over any fleas you see, brushing them off the dog with your hand. Squeeze small amounts of shampoo onto your chihuahua’s back, sides, chest, neck and legs. Lather and rub well until your chihuahua is clean. Open the drain in the bathing area and let the soapy water out. Move your chihuahua away from the tap. If you have hot and cold taps, close the drain and let the water refill to your chihuahua’s lower chest, making sure the water remains lukewarm. If you have only one tap, run the lukewarm water steadily, letting it drain. Scoop water over your chihuahua, soaking him well. Continue until water runs off of him clean and soap-free. Brush any remaining fleas off with your hand. Remove your chihuahua from the sink. Dry him with clean towels until he’s merely damp. Blow dry him if you wish, but never hold the dryer closer than six inches to his body or on one spot for too long. Ensure he’s completely dry before applying flea treatment. Separate one topical flea killer applicator from the set by cutting or tearing along perforations. Depending on which brand you’ve purchased, either open the applicator by unscrewing the cap and jabbing the pointed tip into the tube’s opening area or, hold the applicator upright and snap off its tip with your fingers. Part your chihuahua’s fur between his shoulder blades, exposing his skin. Squeeze the applicator tube, applying its entire contents to the single spot of exposed skin. Keep your chihuahua dry for at least a week. Avoid puddles and don't let him out in the rain. Topical flea treatment is inactivated if your chihuahua gets wet too soon. Wash your hands immediately and thoroughly after applying the topical flea treatment. Ingesting a little will not harm you, but it tastes horrible. If you accidentally rub some into your eyes, flush them with cold water right away. Call your veterinarian immediately if your chihuahua exhibits any abnormal behavior after treatment. Reactions are rare, but never take a chance. Pet Chi Dog: Help, My Chihuahua Has Fleas!